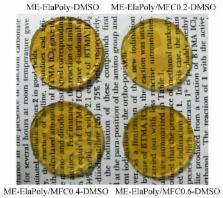 Photocrosslinked hydrogels reinforced by microfibrillated cellulose (MFC) were prepared from a methacrylate-functionalized fish elastin polypeptide and MFC dispersed in dimethylsulfoxide (DMSO). First, a water-soluble elastin peptide with a molecular weight of ca. 500 g/mol from the fish bulbus arteriosus was polymerized by N,N′-dicyclohexylcarbodiimide (DCC), a condensation reagent, and then modified with 2-isocyanatoethyl methacrylate (MOI) to yield a photocrosslinkable fish elastin polypeptide. The product was dissolved in DMSO and irradiated with UV light in the presence of a radical photoinitiator. We obtained hydrogels successfully by substitution of DMSO with water. The composite gel with MFC was prepared by UV irradiation of the photocrosslinkable elastin polypeptide mixed with dispersed MFC in DMSO, followed by substitution of DMSO with water. The tensile test of the composite gels revealed that the addition of MFC improved the tensile properties, and the shape of the stress–strain curve of the composite gel became more similar to the typical shape of an elastic material with an increase of MFC content. The rheology measurement showed that the elastic modulus of the composite gel increased with an increase of MFC content. The cell proliferation test on the composite gel showed no toxicity. Cellulose nanocrystals: chemistry, self-assembly, and applications. Homogeneous suspensions of individualized microfibrils from TEMPO-catalyzed oxidation of native cellulose. Never-dried native celluloses (bleached sulfite wood pulp, cotton, tunicin, and bacterial cellulose) were disintegrated into individual microfibrils after oxidation mediated by the 2,2,6,6-tetramethylpiperidine-1-oxyl (TEMPO) radical followed by a homogenizing mechanical treatment. When oxidized with 3.6 mmol of NaClO per gram of cellulose, almost the totality of sulfite wood pulp and cotton were readily disintegrated into long individual microfibrils by a treatment with a Waring Blendor, yielding transparent and highly viscous suspensions. When observed by transmission electron microscopy, the wood pulp and cotton microfibrils exhibited a regular width of 3-5 nm. Tunicin and bacterial cellulose could be disintegrated by sonication. A bulk degree of oxidation of about 0.2 per one anhydroglucose unit of cellulose was necessary for a smooth disintegration of sulfite wood pulp, whereas only small amounts of independent microfibrils were obtained at lower oxidation levels. This limiting degree of oxidation decreased in the following order: sulfite wood pulp > cotton > bacterial cellulose, tunicin. [* ]Author to whom correspondence should be addressed; E-Mail: teramoto.naozumi@ 123456it-chiba.ac.jp ; Tel./Fax: +81-47-478-0406. Copyright statement: © 2015 by the authors; licensee MDPI, Basel, Switzerland. This article is an open access article distributed under the terms and conditions of the Creative Commons Attribution license ( http://creativecommons.org/licenses/by/4.0/). Mechanical & cell culture properties of elastin-like polypeptide, collagen, bioglass, and carbon nanosphere composites. Swelling and mechanical behaviors of chemically cross-linked hydrogels of elastin-like polypeptides. A Highly Elastic and Rapidly Crosslinkable Elastin-Like Polypeptide-Based Hydrogel for Biomedical Applications.